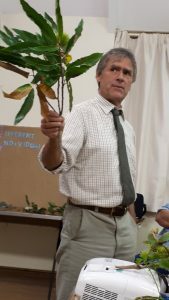 We met in early October for our first autumn meeting to hear Glenn Morris, a local tree specialist and founder of ‘Down to Earth’, talk about Trees and Man. Glenn began by involving everyone is a tree identification exercise –and we needed to get beyond the conifer or deciduous definitions! It was challenging but very good fun – in fact he had difficulty in getting everyone back to their seats. 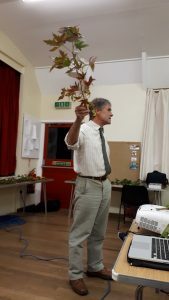 What followed was a lively, passionate talk about the importance and significance of trees; the effect they have on our everyday lives, the environment and globally. We learnt that the greatest threat trees face is globalisation, which has hastened the spread of diseases. He shared many amusing anecdotes with us and the whole talk was beautifully illustrated with PowerPoint slides. He ended his talk with an account of how many years ago he and his fellow students had been asked by their lecturer what they noticed as they stood in the middle of woodland. Keen to impress their lecturer with their knowledge they named the different species of trees. The lecturer then asked them to listen to the wood, and to illustrate the point Glenn played the sounds of a blackbird singing, reinforcing the fact for all of us that trees are part of a whole eco-system. And then, it was tea, coffee and biscuits followed by a drink down the pub, for some of us, to continue the conversation about trees. Glenn kindly donated his speaker’s fees to the Kent Wildlife Trust.